I can’t count the number of times have I've heard stated (while pointing out the rich life styles of big time evangelists such as Benny Hinn, Kenneth Copeland, Joyce Myers and Jesse Duplantis (to name but a few)); that while there are some Televangelist who exploit their position for monetary gain, Billy Graham has been the poster evangelist for truth and honesty . . . one of the truly great Christian preachers who is only here to preach Christ. However, just as I pointed out in my first criticism here seven years ago entitled Wheeling and Dealing J-E-S-U-S! The 21 Century Religion Business , Christian preachers are in the religion business for the money. Thus, the more souls won for Christ, the more money goes into their pockets and the more their family run religious business empires expand. Where the once small time broadcast evangelist used to need some money to get on TV, now with huge ministry overheads fueled in part by personal lavish lifestyles, especially where all family members live the lives of millionaires, many must get on TV to get even more money (many needing over several million dollars a month just to survive). The rest of Billy Graham’s children run the Billy Graham Library outside of Charlotte,NC where books, videos and trinkets (such as Bible versed book marks go for $5.00 . . . likely made in China) while Billy Graham's grandson (Billy Graham IV) runs the Billy Graham Training Center at the Cove near Asheville, NC. Thus, while we at DC think we are letting the air of falsehood out of the ties of the overloaded Christian Bible bus, these big time evangelists see us as little more than a tempest in a teapot as they laugh all the way to their tax free religious banks! Franklin Graham has now shifted his incomes down to $566,417 with the rest in company options and perks not listed as salary. “Samaritan's Purse reported gross receipts of $414,031,085 during the 2010 federal tax year. 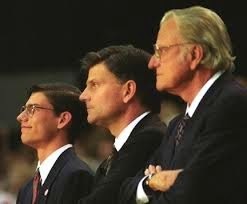 According to public records filed with the Internal Revenue Service, Graham was compensated $409,851 as chairman of Samaritan's Purse and received $156,566 from the Billy Graham Evangelical Association as CEO.” (Quoted from here) For Franklin Graham's perks and compensations apart from salary, see the 2013 tax filing.